H: May 22, 2012: Fellow Juliana's Angler, Shannon Brightman and I were up on the Beaverkill this Sunday for a spey casting class with Andrew Moy of Tight Lines Fly Fishing. He had generously offered to give the Julianas a spey demo class. But several interested members either had scheduling conflicts or had recently taken private lessons. So, that left just me and Shannon. 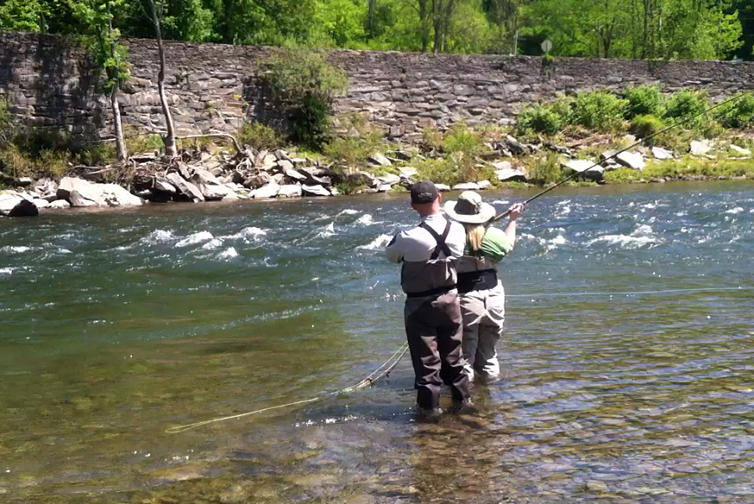 We were both very excited for our spey day on the B-kill and the timing couldn't have been more perfect. 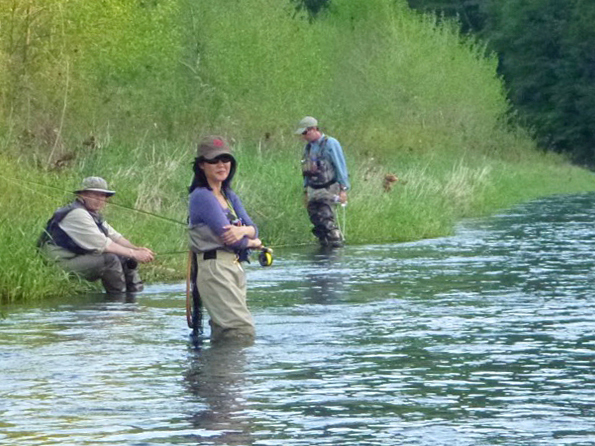 I recently committed to my first ever steelhead trip on the Deschutes river in Oregon in August. I can't wait! All week, I had played the role of water flow monitor, anxiously watching as the Beaverkill dropped from a raging 15,000 cfs!!! Tuesday night to 890 cfs Sunday morning. We met up just after 10 am by the iron bridge in Horton. Andrew set up 2 very different outfits for us to use: an 11' 9", 7-weight, Sage TCX with a 390 grain Airflo Scandi Compact line; and a 13', 8/9-weight G Loomis NRX with a 510 grain Rio Steelhead Scandi line. 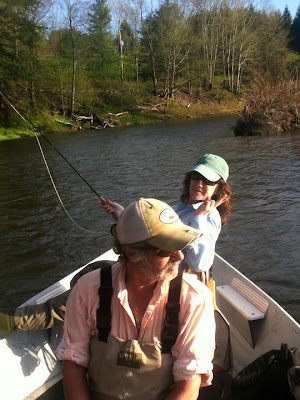 This was Shannon's first experience with spey casting. 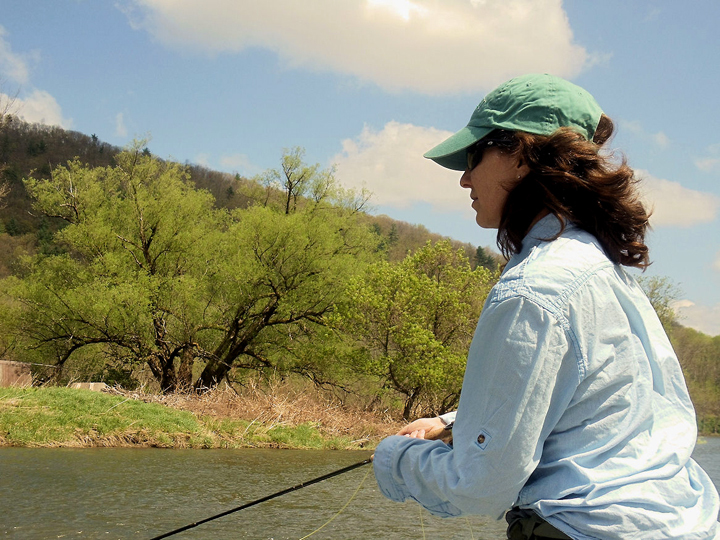 I had learned some spey moves at the end of last year on my 11', 8-weight switch rod (The Beauty of the Switch Rod). I was curious how different it would feel to cast a true spey rod. Shannon executing a snap T with Andrew Moy on the Beaver Kill. We started with a review of the roll cast, the foundation of spey casting. We practiced roll casting until we felt comfortable with our rods. Andrew discussed the concepts of the anchor and D-loop before introducing (reviewing, for me) our first waterborne anchor cast, the Snap T. From there we moved on to a reverse double spey. This was completely new for me. I had learned the double spey last year, but reversing the move and casting over my opposite shoulder felt strange, challenging, yet oddly gratifying those few times I managed to halfway execute it properly. I also managed to knock my cap off my head, with the assistance of a good gust of wind, on one particular bad cast. I made plenty of bloody Ls and several loud cracks with my whip line ; ). It was my usual MO: overthinking all the steps hence lacking enough energy to make a good cast. Eventually, with Andrew's patience and encouragement, it all came together. I shortened my D-loop stroke, added more acceleration, and it finally felt right. Periodically, I looked over at Shannon practicing with Andrew upstream from me and was impressed at how quickly she picked up the casts. 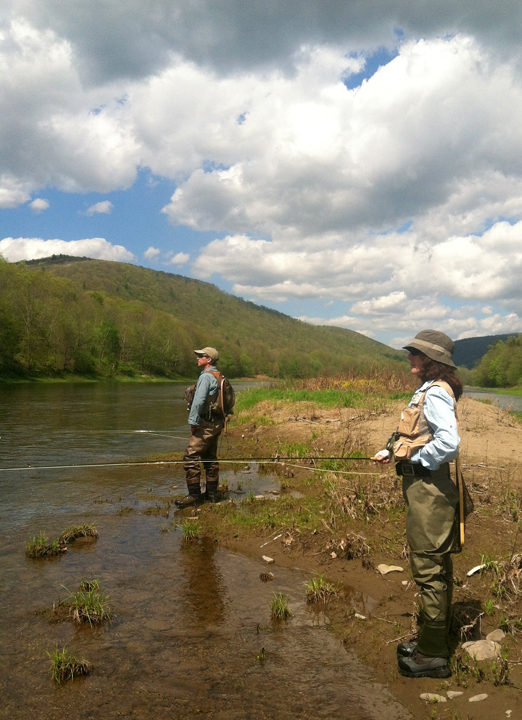 After about 2 hours of snap T and reverse double spey, we moved on to the single spey, an aerialized spey cast. 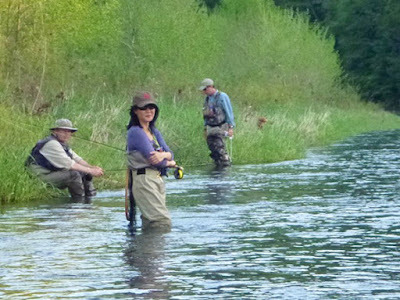 To me, this is the grace and magic of spey casting–watching your line dance on the surface of the water, just kissing it. After 2.5 hours, Shannon decided she was done. Andrew and I briefly worked on the snake roll before I too called it a day. It was after 1 pm, the sun was brutally beating down on us, and I was completely and embarrassingly drenched in sweat. 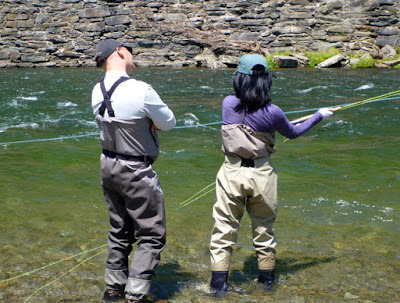 I had hoped to touch upon applying these casts to actual scenarios and strategies for fishing different types of water for steelhead and salmon. I guess a few several more lessons will be necessary. 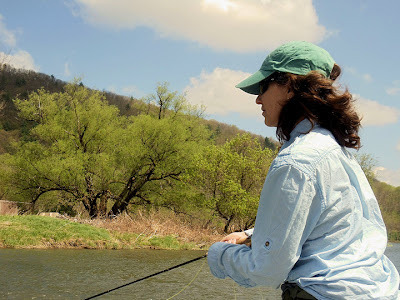 It should come as no surprise to anyone: I am now on the fast track to beginning a spey addict, and I believe Shannon is right there with me : ). When we got back to the car, I realized just how thirsty and hungry I was. Shannon had gone through 3 bottles of water and was still feeling dehydrated. We chatted a bit with Andrew and Nancy, wished them luck with their day's fishing, and parted ways. Craig had text me earlier, asking if we wanted to join him and Richard on the East Branch. 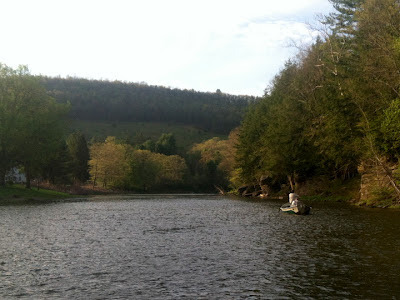 Initially, I declined since Richard and Craig have not fished together for some time (the Master Caster has been MIA in upstate New York, enamoured with a local river there and busy interviewing its denizens). I thought they might need some "guy time." Also, Shannon had mentioned getting in touch with another Juliana who lived nearby. I checked with Shannon to see what she wanted to do. She said she'd be happy doing whatever I wanted. So, I changed my mind. We grabbed a burger at the aptly named Circle C diner then headed over to Richard's cabin. 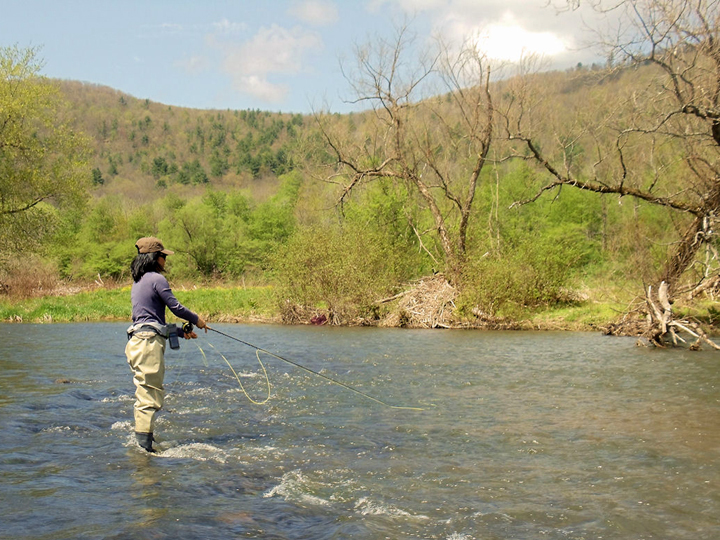 The boys had recently returned from wet wading the East Branch. Wet wading–ahhh!–that sounded so refreshing. They said it had been slow but they had caught some fish earlier. Every time I come back to this pristine and quiet stretch of water, I'm struck by its tranquil beauty and the graciousness of Richard "the rock" Ross : ). 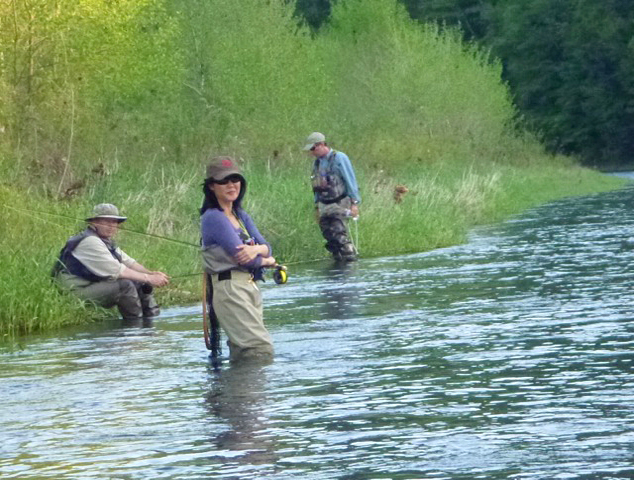 The fishing was very slow that afternoon—sporadic rises, few and far between. Clearly the denizens of the East Branch were dining subsurface but I didn't want to nymph nor did anyone else. I had 1 hit all afternoon. It was on a dropper pheasant tail on the swing of my dry fly drift. I would gladly have fished till dark, but fortunately, Shannon has a life (outside of fishing), so we left the river at 7 pm. As we drove back to the city, we both agreed, it had been a wonderful day. 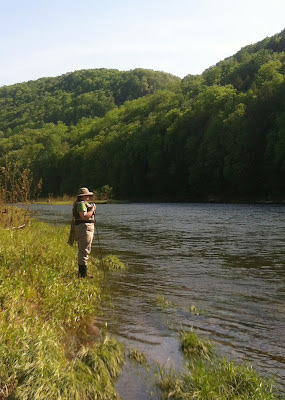 The very serene Shannon Brightman on the East Branch. Shannon: Thanks for the pictures. 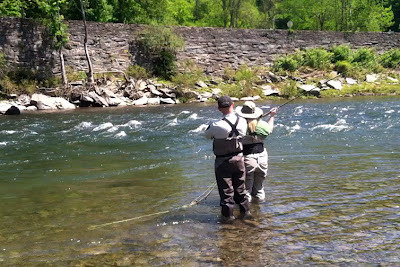 Looking forward to fishing with you again and good luck Friday on the Ken Lockwood gorge. I hope we'll both have some good fish tales to swap at the next Juliana's Anglers' meeting.